Cindy Keefer is an archivist and curator, and the Director of Center for Visual Music in Los Angeles, an archive devoted to Visual Music, experimental animation and abstract media. She curates and presents film and media programs at museums, festivals, cultural centers and archives worldwide, and consults on media in museum exhibitions. She has taught, curated, lectured and published on Visual Music, Oskar Fischinger, Jordan Belson and experimental film and animation internationally, and produced compilation DVDs of the abstract films of Oskar Fischinger, Jordan Belson and other artists. Keefer has preserved dozens of avant-garde films by artists including Oskar Fischinger, Jordan Belson, Jules Engel, John and James Whitney, Charles Dockum, Harry Smith, Mary Ellen Bute, Harry Smith, Jud Yalkut and others. She has worked with Oskar Fischinger's estate since 1997, edited a new book, Oskar Fischinger: Experiments in Cinematic Abstraction (Thames and Hudson, 2013), and co-curated the 2012 Oskar Fischinger exhibition at EYE Filmmuseum, Amsterdam, organized by Center for Visual Music and EYE..She is the curator/archivist for Oskar Fischinger's Raumlichtkunst, a three-screen HD installation exhibited at The Whitney Museum, New York (twice, 2016-17 and 2012),The Tate Modern, London (June 2012 - March 2013), Palais de Tokyo, Paris (June-October 2013), the Len Lye Centre, NZ (2017), and venues in Australia and Germany. Keefer has served as a consultant to The Fischinger Trust, The John Cage Trust, The Solomon Guggenheim Museum (New York), Terrence Malick (Tree of Life feature film), The Hirshhorn Museum and Sculpture Garden (Visual Music exhibition, 2005), Los Angeles County Museum of Art (In Wonderland exhibition, 2012) and other museums, and The Art Directors Guild, Los Angeles.. She served as Adjunct Faculty at the California Institute of the Arts, teaching The History of Experimental Animation, and has given lectures and talks at USC, ZKM Karlsruhe, Oxford (UK), Trinity College Dublin, NYU, UCSB, Carnegie Museum of Art, Goldsmiths, University of New Mexico ARTSLab, Cal Arts, Gallery of Modern Art Brisbane, UT Sydney, Sci-ARC and other institutions worldwide. Keefer has a degree in Film and Television from New York University, and received a Peabody Award for her own work as a director. She is a member of The Society for Animation Studies, The Association of Moving Image Archivists (former Chair of its Access Committee), and Mensa. She is currently working on a book about Jordan Belson and the Vortex Concerts (1957-59). Fischinger Raumlichtkunst installation, at Tate Modern 2012-13; at Whitney Museum 2012; at Palais de Tokyo, Paris, 2013, and GoMA Brisbane 2014-15. Two upcoming installations in 2016. Named in Artforum Best of 2012. 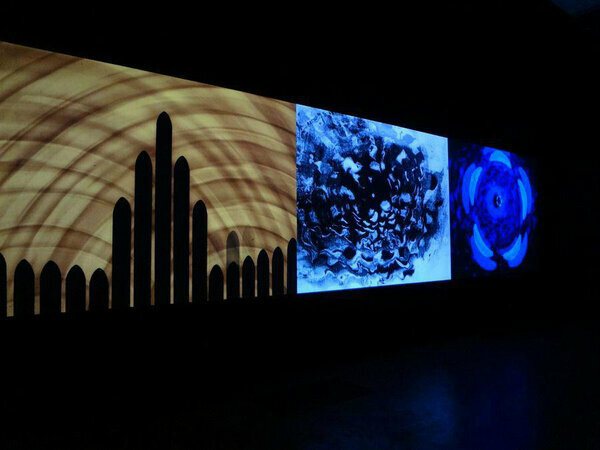 Above left, installation view at Tate Modern, (c) Center for Visual Music. Right, installation at Whitney Museum of American Art, New York. Top left image from cover of Vortex 5 program, 1959. NYC image by Courtney Johns..